The specific objective of this project is to build a website for interlocking, classification and redistribution of official information with the posibility to subscribe to a newsletter (email notifications), thus simplifying access to information. This website will contain all the news from the websites of the most important public institutions , will classify them into several categories and send emails to the subscribers to the newsletter with the latest news from their selected categories. It requires such an application, as few sites offer public institutions such notification, and any other site does not make a classifying of information. 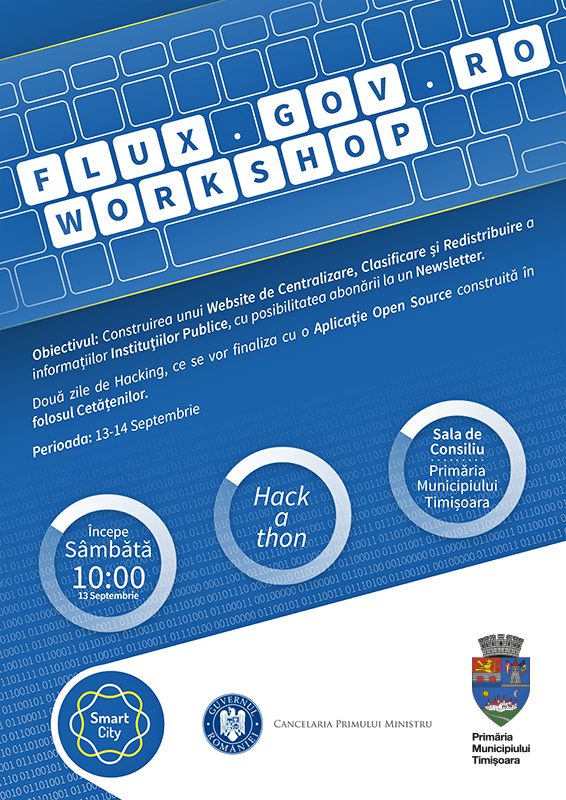 This workshop takes place from September 13 to 14, in the boardroom of the City Hall, from Saturday, September 13, at 10. Participants will be entered in a form, and among those registered will be making a selection within 10 participants. Selection criteria will be experience in IT and expertise. Participants will come up with their own laptop. The form is available here at https://docs.google.com/forms/d/1XfrY-4fFHcHrsQg1DTe2OOxFLdexAxhGd-vLHtmi1gU/viewform. Finally, people with the greatest contribution will be awarded. There will be two days in which the participants will write code, and the end will be an open source application built for the citizens’s benefit. Through this pilot project we try to strengthen the link between the technical community and local and central authorities, and to make known the value of technical community in Timisoara. 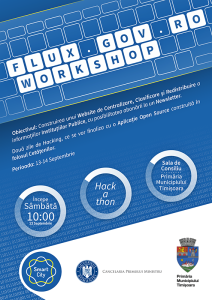 Municipality of Timisoara is the first in the country to get involved in this kind of events.